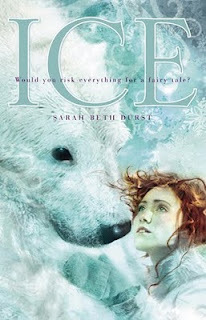 Ice by Sarah Beth Durst. Simon & Schuster / Margaret K. McElderry Books. 2009. Review copy supplied by publisher. The Plot: Cassie loves her life at a remote Arctic research station with her father. It's an isolated life of cold, of snow, of science, just Cassie, her father, occasional visits from Gram and a variety of visiting researchers. On her eighteenth birthday, science ends and fairy tales come true. Cassie discovers that her favorite childhood story -- the whimsical tragic story of her mother being the daughter of the North Wind, Cassie the promised bride of the Polar Bear King, and her mother held captive by trolls -- is true. The polar bear has come for her. The Good: Cassie is an interesting main character. She's stubborn and driven; close to the father that raised her; and so content with life at the research station that she doesn't even want to go to college. Rather, she wants to complete a remote degree so she never has to leave the only life she's ever known. Her mother's fairy tale past and bargains change everything Cassie thought she knew. Her mother didn't die in a blizzard; rather, Gail truly was the adopted daughter of the North Wind who bargained away her unborn child to the Polar Bear King in order to escape the North Wind and live with Cassie's father. The North Wind found the family and angrily attacked the family, blowing Gail to the country of trolls where she has been captive ever since. So in other words, Cassie's only parent has lied to her. Not only that, but Cassie's relationship with her father is closer than many teens because it's not just been the two of them; it's been the two of them in a research station that rarely houses more than a half dozen people. Cassie has modeled her future on continuing in her father's footsteps. All that is shattered, not only because the Polar Bear King has claimed her for a bride, but also because her father lied. This is a fairy tale, so of course Cassie and the Polar Bear fall in love. This is a fairy tale, so at times (times being at night, in the dark) Polar Bear is human. But Cassie doesn't lose herself in Bear and their love. She returns home, having arranged her mother's rescue, only to realize that not only is her mother a stranger, but her father with her mother is almost a strange new person. Pre-Polar Bear, Cassie was a child who, like a child, imagined never leaving home. Now, with return of the mother, Cassie is forced out of her childhood and into an adulthood of her own. Cassie isn't a pinball, bouncing back between parents and Polar Bear husband. Cassie even finds a way to bring her own interest in science and research to Polar Bear's destiny as a collector of souls. Of course, life is not that easy. It never is, whether you're the human bride of the collector of polar bear souls or not. So just when Cassie settles into a happy life with Polar Bear, disaster strikes. Remember how Cassie arranges her mother's rescue from trolls? Polar Bear rescued the mother, in return, Cassie became his bride. This forced marriage becomes real, but of course Polar Bear didn't just say "trolls, give me Cassie's mother please! ", and the trolls didn't say, "sure, since you said please." A bargain was made, promises were made, and suddenly Cassie is left alone as the Polar Bear is made a captive of the trolls. I don't want to give much more away; I love Durst's interpretation of what the Polar Bear is and what the trolls are and what Cassie has to do and figure out to find Bear and free him. I read this during a cold, cold day in New Jersey. It was delicious to have the wind howl outside my window as Cassie put on layers to trek across the Arctic. I cannot imagine reading this in the summer -- unless the air conditioner was cranked up. True confession time. I don't think I've ever read the original fairy tale, East of the Sun & West of the Moon. So I'm not familiar at all with the fairy tale Durst retells. That's OK; with a well-written book, the reader doesn't have to know the tale retold. Don't believe me? I didn't read Snow White & Rose Red, yet adored Tender Morsels . Oh, my heavens! You never read Snow White and Rose Red? Please please PLEASE read it. It is so much sweeter and nicer than what I've heard Lanagan to make it to be. I really recommend reading the original East of the Sun and West of the Moon. It is awesome. I also recommend East by Edith Pattou and Sun and Moon, Ice and Snow by Jessica Day George if you haven't read them. Very good novels. I haven't read the original tale this one is based on either, but I enjoyed it very much. And I second the recommendation for East of the Sun West of the Moon. It's interesting to see two author's takes on the same tale. I've had this one on my tbr pile since it came out because I adored East by Edith Patou. That was the book that got me to read the "original" fairy tale. Later, I took a Cupid and Psyche class and learned that they are essentially the same tale. Thanks for the review. I will need to move it up on that pile. Also, it was nice to meet you at ALA. I read the original after reading and adoring Sun and Moon, Ice and Snow by Jessica Day George. This one looks amazing. Must add it to the list. East of the Sun, West of the Moon is one of my favorite fairy tales. I am so glad so many versions are starting to pop up. This one was a particularly unique take, which I loved. I have this sitting on my shelf, whimpering, "Reeeead meeee" and I keep telling it, "I have so many others first! Pipe down until after the Cybils!" I think this is about the third "East of the Sun West of the Moon" retelling I've read in the past few years, but then I love retellings! Before that, I hadn't heard the tale much, and I looooved fairy tales as a kid.